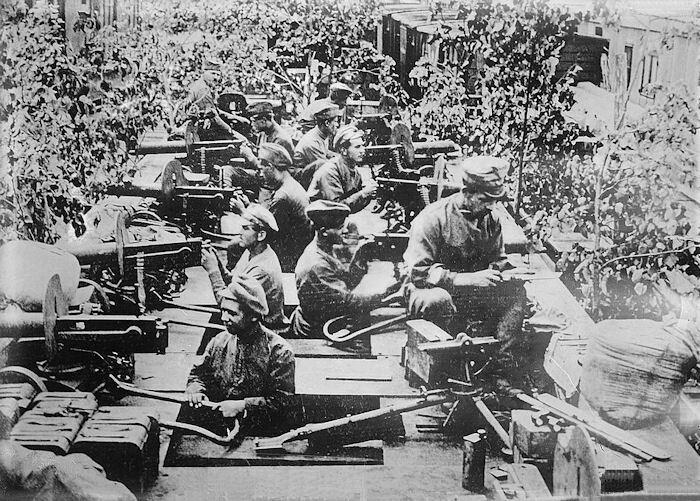 Heavily armed Czech troops who had fought in the Czar's army against the Germans, find themselves stranded inside Soviet Russia wanting to get out. Amid the Russian civil war, the Czechs took a train and began a 6,000-mile cross-country journey toward the port of Vladivostok in eastern Russia. Along the way, they clashed with Bolsheviks and became entangled in the civil war. 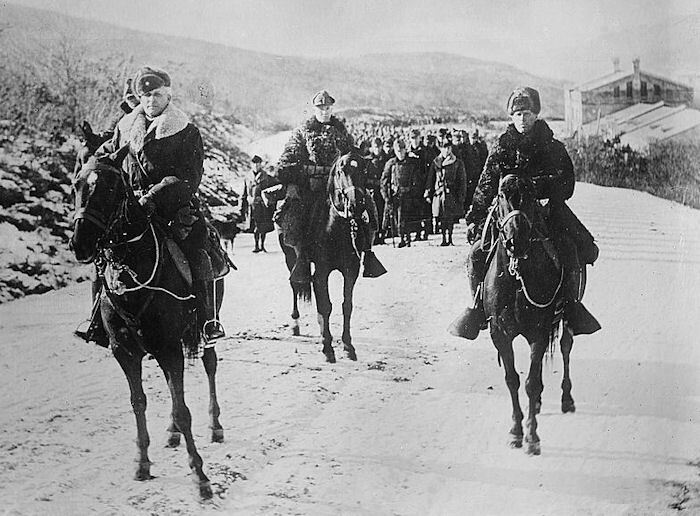 Below: American Lt. Col. Nichols with the U.S. Army 31st Infantry at Vladivostok as part of an Allied effort to tip the scales in the Russian civil war in favor of the anti-Bolshevik (White) Russians. 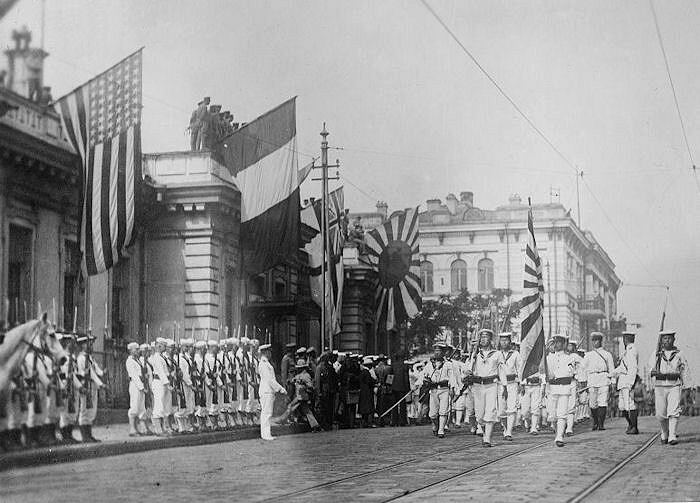 Below: Allied troops stage a parade at Vladivostok that includes Japanese and Americans. The Allies provided a token presence on Russian soil while their ships arrived with supplies for the White Russian troops to help them defeat the Red Army. However, this limited intervention failed as the White Russians devolved into a disorganized jumble of rival factions that ultimately succumbed to the unified and highly motivated Red Army led by Trotsky. 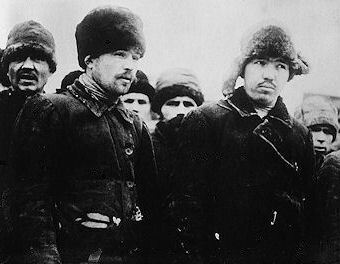 Below Left: Defiant Bolshevik prisoners glare at their captors. 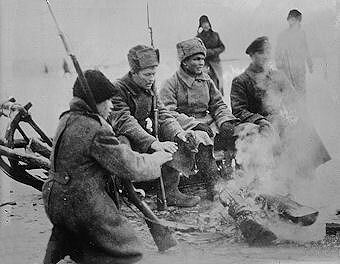 Below Right: White Russian troops in Siberia, seated on a sled, warm themselves by a fire.